The reverse mortgage line of credit growth feature is probably one of the best aspects of the HECM reverse mortgage program. If you owe little to nothing on your home, the reverse mortgage line of credit growth feature can essentially turn a large chunk of your home’s equity into a tax free retirement account that grows and compounds larger over time. Sound crazy? Intrigued? Read on! Think about your home’s equity for a minute. How does it make your life better? Whether it’s $500 or $500,000, what real impact does it have on your day-to-day lifestyle? Probably not much, right? If you don’t plan on selling, the amount of equity in your home is pretty much just a number on paper. It might seem like a nice number, but so what? Unless you have a way to convert that equity into cash, you can’t use it to enhance your lifestyle or financial security. Think about it: you can’t exchange home equity for plane tickets to the Caribbean or a nice dinner at your favorite restaurant. You need a way to convert your equity into cash you can actually use. Having said that, there are ways to convert home equity into cash, but they usually involve monthly payments for thirty years or selling the home (which means you have to find a new one to live in, right?). The HECM reverse mortgage is designed to solve this issue. The HECM reverse mortgage is a type of home loan designed to allow homeowners 62 years of age or older to convert a large portion of their home’s value into tax-free cash without having to give up ownership of the home or take on a mortgage payment. As long as you uphold your program obligations (at least one borrower living in the home and paying required property charges), no monthly payment is required and the loan balance doesn’t have to be paid back. You always remain the owner of the home and are free to will it to your heirs. The loan only has to be repaid when the last borrower permanently leaves the home, whether through selling, passing away, or permanently moving into a nursing facility. The HECM reverse mortgage is a non-recourse loan, which means that the most that is ever paid back is the value of the home – even if it’s not worth enough to settle the entire balance. Reverse mortgage proceeds can be received as a line of credit, lump sum, monthly term or tenure payments, or some combination of all of these options. The option we’re going to focus on here is the line of credit and it’s growth feature (which is super cool!). The HECM reverse mortgage line of credit is very similar to a traditional home equity line of credit (HELOC) in that it’s revolving and can be borrowed against and paid back at your discretion. However, it’s far better because no monthly payment is required and the available line of credit will automatically grow and compound larger with no limit based on an annual growth rate. To see how the reverse mortgage line of credit growth works, let’s take a look at an example. Let’s assume you qualify for an initial credit line amount of $75,000 and the annual growth rate is 5% (pretty reasonable for today’s market). As you can see in Figure 1, after a mere five years the line of credit will have grown to over $95,000. After ten years, it will be worth over $122,000! That’s cash that can be accessed tax free with a simple phone call – no questions asked! And you’ll never be asked to make monthly payments on it as long as you keep up with your program obligations. Because the growth rate applies to your available line of credit, growth compounds on growth. This means that the available credit can really pile up over time – especially if you’ve had the credit line for a number of years (which is why you should get it as early in retirement as possible!). The growth rate will also keep up with prevailing interest rates. If interest rates rise, the growth rate will as well. As crazy as it sounds, higher interest rates could actually end up being a good thing for you! Because there’s no limit on how much the line of credit can grow, it’s even possible it could grow larger than the value of your home. Remember, the HECM is a non-recourse loan, which means you, your estate, or your heirs are not on the hook for any shortage if there’s not enough value in the home to settle the entire loan balance. For another example, let’s assume your line of credit starts off at $150,000 and the growth rate is again 5%. As you can see in Figure 2, the growth really adds up quick. After just five years, your available credit line will be worth over $191,000. After ten years, it’s worth more than a whopping $244,000! If you happened to get this line of credit early in your retirement (say at age 62) and left it untouched for 20 years, you’d have just shy of $400,000 available with just a phone call tax-free at the age of 82. That adds up to a lot of financial security at a time of life when in-home care or other medical expenses can be a huge financial burden. The HECM reverse mortgage line of credit growth feature can be a fantastic way to substantially add to your available liquid retirement assets. Again, it effectively turns a large portion of your home’s equity into a liquid and tax-free retirement account that automatically grows and compounds larger over time. No longer does your home’s equity have to be just a nice looking number on paper that has no real impact on your daily life. If you owe little to nothing on your home and are relatively early in your retirement, the reverse mortgage line of credit growth feature could benefit you enormously throughout your retirement. This is particularly true if you don’t need the money right now because you can leave the line of credit untouched and maximize the growth. 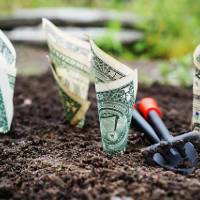 Get your line of credit set up and let it grow and compound over the coming years. By the time you actually need it, you’ll likely have far more money at your disposal than what you started with.